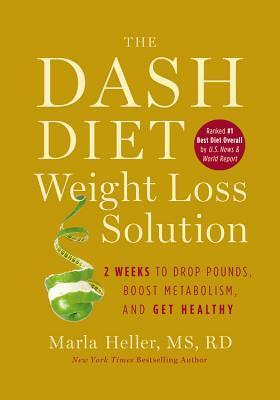 According to author Marla Heller, MS, RD, the Dash Diet Weight Loss Solution's approach is derived from the lesser known lower-carb version of the DASH diet and therefore it is not in fact the fairly well studied DASH diet. Of course you probably wouldn't guess that given the title and the jacket cover that includes this red dot that tells prospective buyers that the Dash Diet was ranked the #1 best diet overall by US News and World Report. In a word I'd sum up this book's promises as hyperbole as the book repeatedly refers to the diet helping to, "reset metabolism", "turbocharge weight loss", and specifically target, "muffin top fat". That's a real shame as one of the main problems involved in modern day dieting are non evidence-based statements made by health authorities, as those statements misinform people from positions of trust. Take spot reduction. Spot reduction is sadly impossible yet a respected health authority repeatedly tells readers in this book that her diet will lead to preferential abdominal fat loss. Honestly, if you remember one thing from this post remember that the second you come across someone or something promising spot reduction your skeptical Spidey sense should start tingling. "weight at which you have no health problems"
"Eating burgers without the bun will become a habit"
"2 weeks to Reset Your Metabolism, Turbocharge Weight Loss and Shrink Your Waistline"
No alcohol, starchy food (defined as bread, pasta, potatoes, rice, etc), fruit, sugar or milk. Heller warns that adherents will feel less energetic, get cranky, bored and may experience a "mini-meltdown". Sounds awesome. She notes that during the first two weeks your body will flush out "excess fluids", but really they're not in excess, they're just the fluids your body stores along with its carbohydrates, and yes indeed, when you're not consuming carbohydrates and you deplete your liver and muscle stores of glycogen you'll probably also liberate 10lbs of fluid (which will return just as quickly if you bring the carbs back into your life). The book provides very specific meal plans and so I took the time to calculate the calories of the first day of the induction phase and the first day of the rest of your life to see what readers might be getting themselves into. Day 1 of the first two weeks clocked in at 1,120 calories, while the first day of the rest of your life rang up at 1,250. In my experience it's an exceedingly rare person who is happily satisfied on an average of 1,200 calories a day. As well Heller notes that once you get to where you want to go weight wise you're to start bringing back dessert, potatoes and grains. But if you lose weight with a particular intervention (like for instance avoiding dessert, potatoes and grains) and then you stop that intervention, whatever weight you lost consequent to that intervention is likely to come back. On the plus side for this book, the recommended foods are healthful and there's an emphasis on cooking from scratch. If you do choose to pick this one up, I'd encourage you to increase the portions provided until you feel satisfied as weight loss through white-knuckled 1,100-1,200 calorie hunger simply isn't going to stay off. Personally I'd much rather you ate more and lost less and stayed there than to crash your weight down with overly aggressive restriction only to gain it back again because like the rest of our species, you weren't up for a lifetime of unnecessary suffering.